The Federal Trade Commission is examining whether Valeant’s recent acquisition of a company that makes a key component of rigid contact lenses violates anti-trust laws. The Federal Trade Commission is investigating whether Valeant Pharmaceuticals International has illegally cornered the market for a key component of rigid contact lenses, according to people familiar with the inquiry. Valeant, a large drug maker, has been under fire in recent months for steep price hikes on its heart medications. Its stock has sharply declined over the past week as investors questioned its convoluted relationship with a network of specialty pharmacies. The company disclosed on Monday that it received a letter on Oct. 16 from the FTC that it had begun a “non-public investigation’’ into its purchase of Paragon Vision Sciences, a company that makes rigid contact lenses. Valeant provided no details about the focus of that inquiry and did not respond to an email seeking additional comment. The FTC confirmed the inquiry but said it could not provide any further information. Four people who have been interviewed by the FTC told ProPublica that the agency was investigating whether the purchase of Paragon had given Valeant monopoly control over a slice of the contact lens market. The FTC is charged with enforcing anti-trust laws that bar companies from obtaining and exercising their dominant market power to the detriment of consumers. 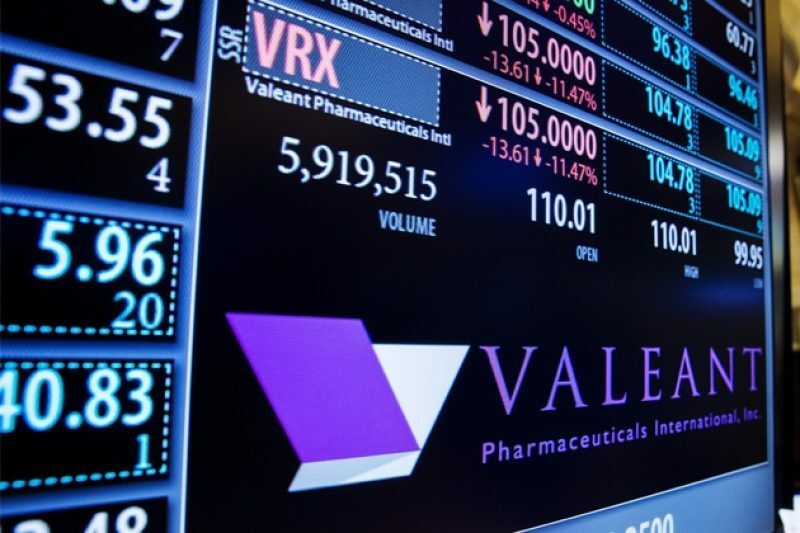 Valeant has grown rapidly by buying other companies, and the FTC inquiry appears focused on the cumulative effect of two purchases: Paragon, which it bought in May, and Bausch & Lomb, which it acquired in 2013. The two companies had been competitors in the sale of materials for what are called gas permeable lenses, which are used by people who cannot wear the more-popular soft lenses. The Paragon acquisition gave Valeant control over 85 to 90 percent of the supply chain for gas permeable lenses, according to Jan Svochak, president of the Contact Lens Manufacturers Association, an industry trade group. Gas permeable lenses are worn by people over 40 who need multifocal lenses to both read and see long distances, patients with abnormal curvatures of the eye, those with dry eyes or who’ve had eye surgery, and veterans of the wars in Iraq and Afghanistan who suffered eye damage from improvised explosive devices. All told, about 3 to 4 million people — roughly 10 percent of the contact lens market — wear the rigid lenses, lab owners say. There remain small competitors producing components of some rigid contact lenses. But Valeant is now the only supplier for the material needed to make a type of contact lens worn that reshapes the cornea overnight so users don’t have to wear glasses or lenses during the day. In the months since the acquisition, Valeant has shaken up the contact lens industry. It has doubled the cost of some materials, eliminated volume discounts, dropped out of the main contact lens manufacturers trade group, approached several labs about buying them out and sent letters telling others that it would cut off some of their supplies at the end of the year, several manufacturers said. Optometrists and lens manufacturers say consumers will pay more for their lenses, but it’s unclear how much more because Valeant’s price increases were only implemented in September and then again this month. “We’ve seen this pattern with Valeant in other things that they’ve done,” said Svochak, who runs a lab that makes contact lenses in Texas. Svochak said he is concerned that Valeant will use its monopoly powers over the industry to force labs out of business. “Then, the pricing will go up significantly,’’ he said. “They’re trying to put us out of business. Why? So they can own the market.” Svochak said he has discussed his concerns with FTC investigators. One growing area of the market is known as Orthokeratology, or Ortho-K, because it can achieve results similar to Lasik surgery. Patients sleep wearing their lenses, which changes the shape of the eye so that lenses aren’t needed during waking hours. Bausch & Lomb and Paragon have the only device approvals from the Food and Drug Administration, Svochak and others said. Now, both are owned by Valeant. The price of gas permeable lenses is often higher than for soft lenses because they are custom made for a patient’s eyes. They can be worn for longer — from one year to several years — but at a cost to patients of a couple hundred dollars for a standard design for healthy eyes to $750 for a more-complex design for diseased eyes. Contacts that reshape corneas overnight typically range from $1,000 to $2,500 for a pair. Bennett is executive director of the Gas Permeable Lens Institute, the educational division of the Contact Lens Manufacturers Association, which receives a small portion of the sale of raw materials for each rigid lens from member companies. He said he has also talked to the FTC. Rigid contact lenses are manufactured in two stages. There are companies that create the basic component — known as a “button” — and separate labs that customize them to fit patients’ eyes. Valeant’s acquisition of Paragon gave it almost complete control over the button makers. Now, lab owners say, Valeant has been talking about acquiring labs and becoming the dominant player among lens makers. According to Svochak, the total market of the rigid lenses was about $100 million a year, with roughly $20 million of that going to materials. That’s a tiny fraction of Valeant’s $8.3 billion in annual revenues last year. Doctors are trying to figure out what the recent price changes mean for them. The cost of a plastic button used by manufacturers to make the Ortho-K lenses — the ones worn overnight — increased from as low as $6.30 per unit earlier this year to $20 this month. The finished product historically has been sold to doctors for $60 to $100 a lens, but that cost will rise, manufacturers said. Separately on Monday, Valeant disclosed that it received a subpoena last month from the U.S. Department of Justice regarding payments made by Bausch & Lomb to medical professionals related to two of its products, the Crystalens intraocular implant used during cataract surgery and the Victus femtosecond laser, used during eye surgeries. Data from ProPublica’s Dollars for Docs tool shows that Bausch & Lomb made $338,000 in payments to doctors related to the Crystalens between August 2013 and December 2014 and $438,000 tied to Victus.